students will feel a personal connection to the course. Hebrew we grew up hearing in synagogues and whatnot, but its Yiddish that our grandparents are yelling at us from across the house, said Sharfstein, a 20-year-old UF philosophy sophomore. Abend-David said its a language of personal history because grandparents speak it. a very sentimental role, he said. Jared Kaplan, a 20-year-old UF biochemistry and psychology sophomore, said he thinks the class will also appeal to other students who may not be familiar with Jewish culture. When youre learning a language, youre not just learning a language, youre learning about the culture itself, Kaplan said. It gives you a different perspective on other cultures and a different way of thinking about things, in their own native tongue. Abend-David said intellectually, there is a lot to be gained by teaching Yiddish. Its a very colorful, varied course, AbendDavid said. 4, ALLIGATOR WEDNESDAY, OCTOBER 16, 2013Kan Li / Alligator StaffNoam Chomsky, a world-renowned linguist, philosopher, cognitive scientist and logician, delivers a special guest lecture Tuesday evening at the Phillips Center for the Performing Arts. ALEXANDRA DACOSTAAlligator Contributing WriterAlthough the Hough Graduate School of Business was recently ranked by Forbes as a top national business school, students and faculty still see room for improvement. Forbes put together the list of the top MBA programs in the U.S. earlier this month, and UFs graduate business program is ranked at No. 63 out of 70. Brian Gendreau, a professor with the Hough program, ing. He said although the school needs to improve its ranking with Forbes, it is doing a lot of things right. Floridas business school programs are very rich. We attract high-quality faculty and high-quality students, he said. According to the Forbes website, Hough alumni have an average of 87 percent employment after graduation, a median base salary of $75,000 and a median signing bonus of $10,000. Out of all the schools Randa Medley applied and was accepted to, she chose UF because of its reputation for academics and is thrilled with the ranking. Medley, a 20-year-old UF graduate student in international business, said although UF didnt make the top 10, she thinks the ranking could still help her land a better job in an extremely competitive job market. It makes me feel proud to be a student here and that I have the opportunity Ive been given to study here, she said. The ranking shows me that Im getting a quality education. Craig Petrus, the director of graduate business career services at Hough, said he hopes for the school to partner with more Fortune 500 companies located nationally in order to raise the ranking. I think that any time the Hough business program is ranked nationally with other elite business schools, it is a good thing for the program, Petrus said.Locals: Forbes ranking means school should get down to business THE SERIES GOES THROUGH OCT. 31. MELISSA FLANJACKAlligator Contributing WriterThe Center for Leadership and Services fering a series of events to teach students how to address social issues. There will be different events each day through Oct. 31, including documentary screenings, guest speakers and discussions on controversial topics such as gay marriage and anti-bullying. Social Impact Week will focus on making students more socially responsible, said Angela Garcia, director for community engagement and service-learning for the center. Part of (being socially responsible) is understanding the social issues that face your community, Garcia said. Garcia said the center created Social Impact Week so different socially minded events can merge together around the same time. Events will be hosted by departments and organizations such as the Bob Graham Center for Public Service, the Institute of Black Culture and the Bahai Association. Maddie McClinton, a 19-year-old UF elementary education sophomore, said she is looking forward to the two-day Gator Global Initiative conference. Hearing others passions reassures me there are individuals, even right here at UF, that will create a change for the better, McClinton wrote in an email. McClinton, the student director of ambassadors for the Center for Leadership and Service, said Social Impact Week is important to students because the events provide an opportunity for them to be educated on social issues.Events encourage students to get socialSome UF students called Chomskys speech unfair, but others found it neutral Just seeing how many people were there and how happy they were to be there, not only to see Chomsky but to see that large of an audience, was really a powerful thing, he said. 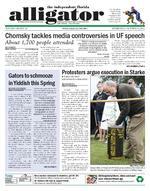 However, UF students like Raya Elias-Pushett, a 19-year-old anthropology sophomore, called Chomsky controversial. She said she found some of his characterizations, particularly of the Midment, unfair. I think that he focused too much on what is neglected in the media and not enough on how facts are presented, period, she said. I think that his point of view, although academic and respected because of his previous work, is not necessarily the most accurate or the most nonbiased. Anusha Hudda, an 18-year-old UF pre-nursing freshman, agreed that Chomskys opinions were thoughtprovoking, if not entirely neutral. Even though we could tell what side he was on, and what he was trying to accomplish with the speech, it was nice to hear a different side, Hudda said. Ryan Dargan, an 18-year-old UF mechanical engineering freshman, said Chomskys views should be taken with a grain of salt. great, thought-provoking points that kind of opened my eyes in a sense, he said. A lot of it though, you have to take it that its just his opinions. CHOMSKY, from page 1 OY, from page 1Older relatives often speak itCAMPUS Hearing others passions reassures me there are individuals, even right here at UF, that will create a change for the better.Maddie McClintonUF elementary education sophomoreCAMPUS JACLYN DE BONISAlligator Contributing WriterStep aside, Panda Cam three live streaming web cameras have been added to the Florida Museum of Natural Historys ButBasically, its viewable to the world now, said Paul Ramey, museum spokesman. erations, said the chrysalis cam gives viewers the chance to see camera focuses on a fruit tray, and the third canopy cam is placed about 30 feet in the air, which gives a much broader birds-eye view of the rainforest. Marissa Rios, a 20-year-old UF wildlife ecology and conservation junior, sees them as good for people who live far away. work with any Android devices, and they still dont work with all operating systems. He said a patron could also use the cameras to see the weather in Gainesville before deciding to visit. Fessenden said the weather plays an important role in the the less action. He said a downside with the cameras is that if the weather is bad, visitors might not choose to come.